I am back with The Cake Slice Bakers this month, after missing last month's challenge much to my dismay. I wasn't missing this month since this recipe is one of the main reasons I bought Alisa Huntsman's (which, by the way, if you click on Alisa's name, you will go to her blog!) book, Sky High: Irresistible Triple Layer Cakes. Devil's Food cake may very well be my favorite - no surprise there since it is chocolate after all. What I truly love about this recipe though (and for that matter most of the recipes in the book) is that it is so unique to any other Devil's Food I've seen or made. Most of the Devil's Food recipes I've seen use a combination of unsweetened cocoa and melted chocolate, which is truly rich and delicious, but always a bit overwhelming on my ingredients supplies and budgets. It is awesome to have a beautiful cake, but when it wants to use my cocoa supply, and a good amount of my chocolate supply, it is a bit of a struggle to justify making it. Happy Day After Devil's Food Cake Day! Yes, it's true, May 19 was National Devil's Food Cake Day here in the U.S.! So, in my opinion, the unique thing about this recipe is that it uses only unsweetened cocoa powder - a full cup of it. Another thing that was different than a lot of recipes I've seen is that there was no buttermilk, or any milk for that matter. Also, no granulated sugar. The other really unique thing I found with this recipe is that it uses no white sugar, but it did put a large dent in my brown sugar supply! In fact, the cake uses 3 cups of packed brown sugar! Since I seriously loooooove brown sugar, this was fine by me! The other portion of the dent in my brown sugar supply came from the buttercream, which got its slightly tawny, creamy white color from making a sugar syrup using 1 1/4 cups of light brown sugar and only a 1/4 cup of water. It was a really lovely syrup too! To further gild the lily, I used some unsalted imported Irish butter in the buttercream that I had on hand for another project that I was planning (I can get more when I actually get around to it I guess) since all my other unsalted butter was still languishing in the freezer - poor planning on my part! So, overall, the cake itself, funny enough, was rich, moist, chocolatey and absolutely delicious - when I ate a piece out the refrigerator it actually tasted just like a chocolate ice cream sandwich to me! I know I will make this recipe many more times. For my layer cake I used a 14-inch square pan and filled it with about just under 3/4 of the batter. The remainder of the batter made 12 cupcakes for me, which are now in the freezer for some rainy day when I need a chocolate fix! I cut the cooled large square into four smaller squares that I then stacked to make my layers. It made one very tall and irresistible layer cake! 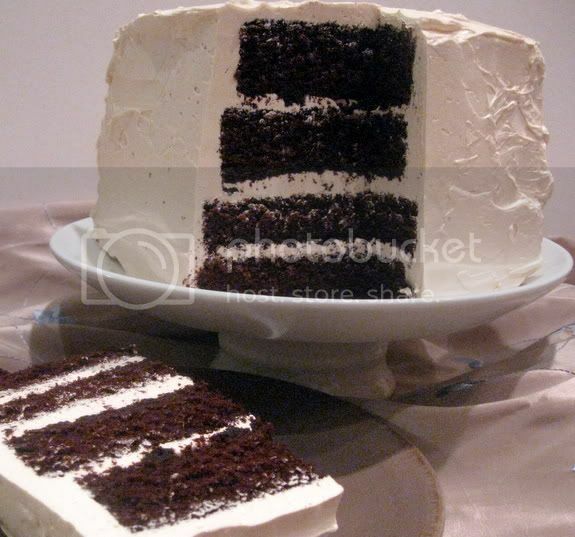 Make sure to check out all the other Devil's Food Cakes at The Cake Slice Bakers Blogroll! This cake was SO good! Definately a stunning cake. 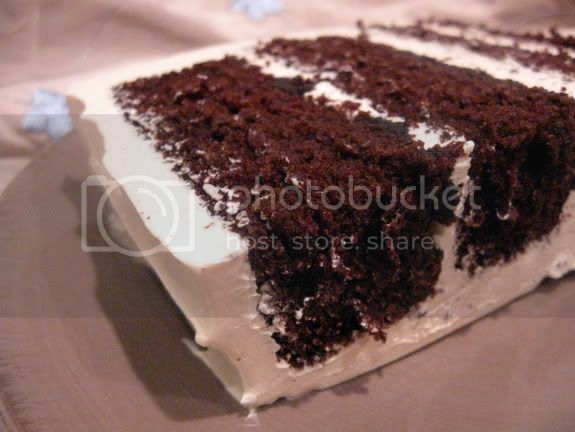 Dark layers f chocolate sandwiched with lovely cream ...yummy !! WOW--what a cake! Looks awesome. looks so good! all those ingredients did not go to waste! Beautifully done and great job. Love the frosting and it all looks so neat and pretty. This looks absolutely amazing! What a great special treat cake this would be! Great job! This cake looks so fantastic! It's absolutely gorgeous. thanks so much for the kind words. this is one of my favorite cakes in the book too! how can you not love chocolate? it has been so much fun looking at all of the blogs from the cake slice bakers, i actually look forward to the 20th of each month! Wow! It looks delicious. How can it not be? I am going to try the "square cake stack" like you did! Love that look. I was given a blog award and asked to pass it on to 15 other bloggers. I love your blog, especially the cakes( I might seriously have to buy this sky high cake book) and wanted to pass one along to you. You can get your award at mysisterskitchen2009.blogspot.com. If you can, pass it along to 15 other bloggers. Thanks again for all the great recipes. wow 4 layers! I can barley keep three from sliding! Your cake looks beautiful! All that brown sugar - it's gotta be good. I love brown sugar. But a whole cup of cocoa powder? Wow! Looks gorgeous. How beautiful! 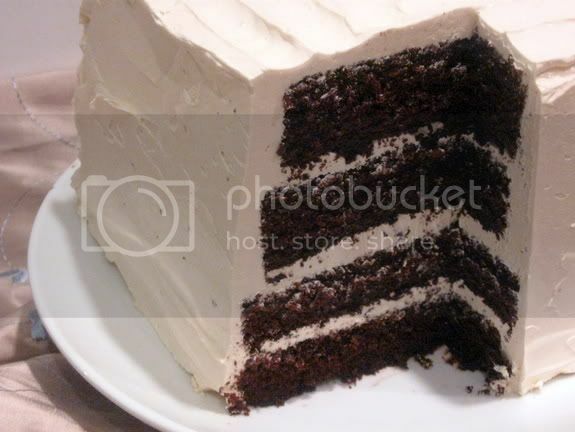 How can it be Devil's Food Cake without buttermilk or milk? Very interesting. I like cakes made with cocoa powder, and I bet the brown sugar added a nice warm rich flavor. WOW four layers, looks great! This is soooo sky high! It looks lovely! Holly this looks yummy. I bought this cookbook a while back, but haven't taken the time to make anything out of it- yet...this may be the first recipe I try. How long did it take you start to finish? love the description of the cake tasting like an ice cream sandwich. beautiful too! Looks Yummy! Chocolate cake is my favorite. I will have to try this one since I have the cookbook. This IS an interesting recipe. What brand of cocoa did you use? I love the square cake! Very pretty! I completely forgot about cake slice this month. Wish I hadn't. Yours looks lovely. **SIGH** four layers of chocolate heaven. TeaLady is absolutely correct, Chocolate Heaven is what you've created. Great job!